Dr. Mina Sartipi is the Director of the Center for Urban Informatics and Progress (CUIP) and is also a UC Foundation Professor in the Computer Science and Engineering Department, where she leads the Smart Communications and Analysis Lab (SCAL). She received her B.S. in Electrical Engineering from Sharif University of Technology, Tehran, Iran in 2001 and her M.S., and Ph.D. degrees in Electrical and Computer Engineering from Georgia Tech in 2003 and 2006, respectively. In 2008, she was named UC Foundation Assistant Professor. This award was given to her based on her research activities and students evaluating her teaching. She was awarded the UTC Outstanding Faculty Research and Creative Achievement award in 2016. She has also been awarded the best researcher in the Department of CSE and the college of CECS in 2010, 2013, 2014, and 2015. Dr. Sartipi has been an IEEE senior member since 2016. She has been a member of the Board of Directors for the Enterprise Center, Chattanooga, TN since 2017. Since 2013, Dr. Sartipi has been a member of the Board of Directors for the Variable, Inc., Chattanooga, TN. Dr. Sartipi’s research interests are in the area of communications and data science, in particular advanced wireless communications and data analysis for smart healthcare and urban futures. She has served as the technical program chair of conferences in the areas of wireless communications and networking. Additionally, Dr. Sartipi has been called on to review several papers on data compression and error control coding for various IEEE, ACM, and EURASIP conferences and journals in the past several years. Dr. Reinhold Mann was appointed Deputy Vice Chancellor for Research in July 2018. 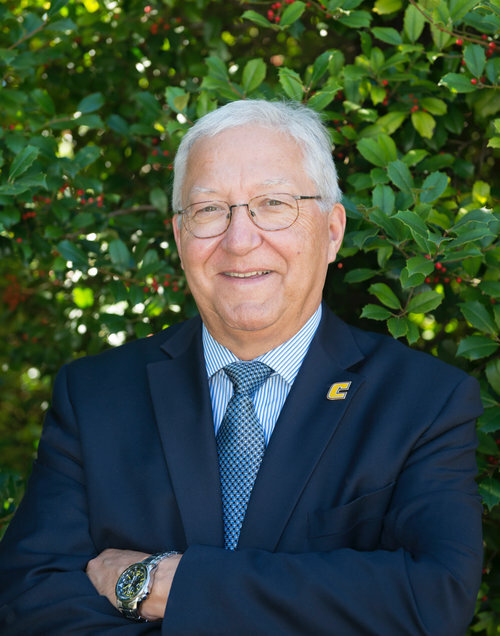 He has been working with the Vice Chancellor for Research on strengthening collaborations with Chattanooga and the region, most recently with the newly formed Chattanooga Smart Community Collaborative. From 2015 until 2017 he served as the Interim Director of the SimCenter at UTC, a center of excellence in applied computational science and engineering. His work included engaging faculty across UTC in the strategy development for the SimCenter as a core capability in modeling, simulation and high-performance computing, ensuring that the strategy remained relevant, and managing program development efforts with potential for sustainable extramural funding for the Center. Mann is also working to promote new collaborative research opportunities between UTC and the UT System, foremost UTK and UTHSC, and with the Oak Ridge National Laboratory (ORNL). Mann retired on June 30, 2014 from his position as Associate Laboratory Director for Environmental, Biological and Computational Sciences at the Brookhaven National Laboratory (BNL), where he was responsible for R&D programs in biology, biotechnology, climate science, and computational science and related efforts. Before joining BNL, Dr. Mann was the Senior Vice President for Research and Development at Battelle Science and Technology Malaysia Sdn. Bhd. in Kuala Lumpur, Malaysia. He moved to this position in November 2008 after leading the Biological and Environmental Sciences Directorate and Program at the Oak Ridge National Laboratory through a five-year period of transformational change with respect to research programs, infrastructure and capability renewal. From 2001 through 2003 he was Deputy Lab Director for Science and Technology, Chief Research Officer, and Associate Lab Director for Fundamental Science at the Pacific Northwest National Laboratory (PNNL). Dr. Mann’s research has been at the intersection of the physical and computational sciences with the life and environmental sciences. He has been leading multi-disciplinary R&D teams since 1986 and developed several R&D efforts in intelligent robotics, human-machine interactions, advanced information processing, computational biology, bioinformatics, systems biology and bioenergy. Mann obtained a Diplom-Mathematiker degree (equivalent to an MS in Mathematics), and a Dr. rer. nat. degree (equivalent to a PhD) in Physics from the Johannes Gutenberg University in Mainz, Germany. He was awarded a Feodor- Lynen-Fellowship by the Alexander von Humboldt Foundation in Bonn, Germany to do post-doctoral research at the Oak Ridge National Laboratory in 1981 and 1982. He is a Senior Member of the IEEE, and member of the APS and the AAAS. Joshua S. Fu is the John D. Tickle Professor in the Department of Civil and Environmental Engineering and an Inaugural Professor of the UT-ORNL Bredesen Center for Interdisciplinary Research and Graduate Education, Faculty Affiliate at the UT-ORNL Joint Institute for Computational Sciences at the University of Tennessee, Joint Appointment Professor in the Climate Change Science Institute and Computational Sciences and Engineering Division at Oak Ridge National Laboratory. The focus of Fu’s research work includes climatic changes, air pollution modeling, air quality impact assessments, the impacts of extreme events on health, the impacts of transportation planning on air quality, energy assessment, land use (satellite applications) and emission flux, diesel track emission effects, and energy optimization planning. Dr. Hathaway received his PhD from North Carolina State University in 2010, where he studied the fate, transport, and removal of indicator bacteria in urban stormwater runoff. After a brief research fellowship at Monash University in Melbourne, Australia, and nearly two and half years at one of the nation's leading ecological design and consulting firms, he joined the Department of Civil and Environmental Engineering at the University of Tennessee. Dr. Hathaway is a 2016 recipient of the National Science Foundation CAREER award. Dr. Yu Liang is an Associate Professor in the Department of Computer Science and Engineering of University of Tennessee at Chattanooga as. His funded research projects cover the following areas: big-data and cloud computing, multiscale modeling and simulation, high-performance scientific and engineering computing, numerical linear algebra, sensor-oriented machine learning, computational mechanics (with focus on structural mechanics and biomechanics), and fault-tolerance techniques. His research work has appeared in various prestigious journals, book or book chapters, and refereed conference, workshop, and symposium proceedings. He owns one technical pattern that is registered at Univ. of Tennessee Research Foundation (UTRF). Dr. Liang is serving in the International Journal of Security Technology for Smart Device (IJSTSD), Journal of Mathematical Research and Applications (JMRA), and Current Advances in Mathematics (CAM) as an editorial board member. Dr. Chandra Ward is an Assistant Professor of Sociology at the University of Tennessee at Chattanooga teaching urban sociology and a number of other sociological topics. Her research is guided by the philosophy of helping to amplify traditionally marginalized voices. This is evident in her research on public housing residents and her textbook, an intersectional introduction to sociology reader titled, Voices From the Margin: Fresh perspectives on an introduction to sociology.” Professor Ward also uses photography and social media to help make sociology accessible to those outside of academia. It can be found here at sociologysocialshutter.blogspot.com. Dr. Dalei Wu is a UC Foundation Assistant Professor with the Department of Computer Science and Engineering at the University of Tennessee at Chattanooga (UTC). Before joining UTC, he worked as a Postdoctoral Researcher with the Mechatronics Research Laboratory at Massachusetts Institute of Technology (MIT). His areas of expertise include cyber-physical systems, intelligent systems, multimedia computing, and mobile computing. His is particularly interested in using methods of modeling, simulation, optimization, and machine learning to solve real-world problems. He has published research papers in some prestigious journals, such as, ACM Transactions on Modeling and Computer Simulation, IEEE Transactions on Industrial Informatics, IEEE Transactions on Automatic Control, IEEE Transactions on Circuits and Systems for Video Technology, IEEE Transactions on Wireless Communications, IEEE Journal on Selected Areas in Communications, IEEE Transactions on Multimedia, and IEEE Transactions on Communications. His research has been funded by NSF and the state of Tennessee.